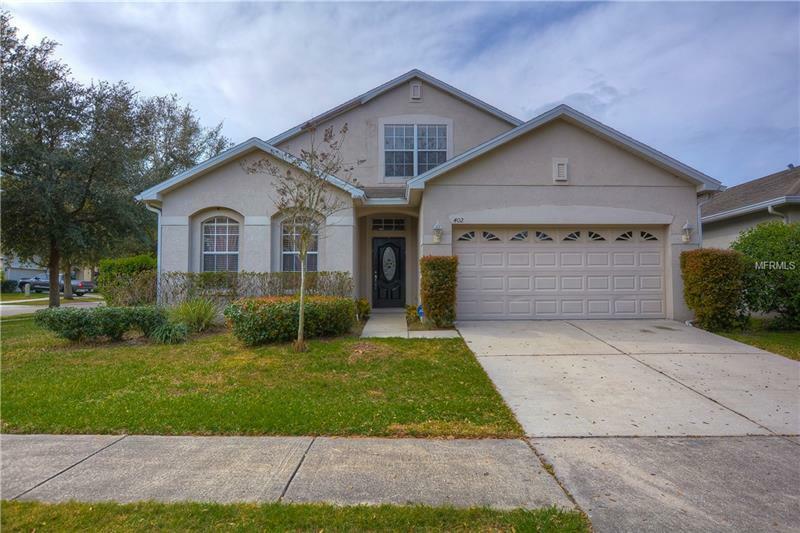 Welcome to this adorable home located in a wonderful location that is just a short drive to I-4, if you need to have access to either Tampa or Orlando, this would be a great home for you! Built in 2007, this home sits on a corner lot on a quiet street so it would the perfect choice to call âhomeâ! An attractive elevation welcomes you with pretty glass accented garage doors & meticulous yard! Inside the front door you are greeted by neutral paint colors, column accent & bright & open living space! The combination formal rooms with tile floors are a wonderful entertaining space! Continue on to the family room & you are welcomed with more tile floors & slider out to the patio! This space is open to the warm kitchen that boasts raised panel wood cabinets topped with crown, island & granite counters! You will enjoy hosting family meals here! The welcoming master suite with double door entry is private & offers a master bath with garden tub, separate shower, his & hers sinks, wonderful granite counters & walk-in closet! In addition you will find two secondary bedrooms & a full bath on the first floor! Upstairs you will find a HUGE bedroom with volume ceilings & itâs own full bath! This is the perfect space for a teenager who wants privacy or guests! Outside you will discover a screened patio that is the perfect spot for some quiet time! Overlooking the fully fenced yard, you can sip your morning coffee, read your newspapers, whatever you feel like! You are going to love this home, it really is a charmer!